I am not saying that all my initial conversations begin like this, but many do. I am sure many other similar industries (i.e. web designers/developers) encounter similar conversations as well. While social media has become a major priority for businesses, many organizations do not realize that social media requires a preliminary research, strategy, and proper implementation – just like traditional marketing methods. This is a blog about the 3 major mistakes that businesses are making with their Facebook Pages. Personal Timelines are meant for people, not businesses. Organizations, companies, celebrities, artists and musicians can create a business Page without having a Facebook Personal Timeline (I would love to meet the individual who started the rumor that this is impossible). Therefore, no company should be using Facebook Personal Timelines as their business. Ever. If your social media has been set-up through this method, there are solutions. Email me (socialmedia@jenniferbakerconsulting.com) and we can set-up an appointment to find a solution for your company. Remember that summer student who set-up your Facebook business Page 3 years ago, well they are likely still an administrator on your Page. Translation: They still have access to post on your Page’s behalf, upload photo albums, add applications, change profile and cover photos – they can do anything they want to. Concerned? You should be! Take a moment and visit your Page’s administrative settings to ensure that only currently employees/consultants are administrators of the Facebook Page. When you’re taking a peak at the administrators, take a moment to assign proper roles for each of the Admins (i.e. Manager vs. Content Creator). People have “Liked” your business’ Page to receive updates about your business and the industry in which you operate. Give the people what they want! Provide topical, concise and informative updates to your Facebook fans a few times throughout the week. Try to include images, videos, and links for the best results. Note: For those of you who have Twitter automatically update your Facebook Page, you may want to rethink your strategy. Social media should be treated as any other marketing method would be treated – with goals, strategy, and proper training. You wouldn’t let a graphic designer sell your house, or a musician set-up your retirement plan. Remember, use the right tool for the right job. In my last blog I wrote about the opportunities to receive formal education in the field of social media. I was surprised to learn that so many degrees, certificates, and masters programs were available all over the world. There was a blend of online/in-person learning, synchronous/asynchronous learning, full degree programs, or simple professional development certificate programs. I am delighted to hear that so many educational intuitions are listening to what the market needs and designing programs to fill these needs. The problem with social media, specifically Facebook, is that lines become blurred due to the cross-over between personal and professional life. Individuals can maintain a personal profile for friends, as well as a business page for professional colleagues. I agree that there can be a lot of clutter on Facebook with game applications, personal applications, and promoted posts. However, an individual using it for business-purposes must be able to break through the clutter to see the true value in this marketing tool. Remember that social media platforms are marketing tools, just like a business cards or a websites. As a result, the integration of social media platforms into a business’ overall marketing strategy can be an important component. Social media can be a great opportunity for businesses due to its low barriers to entry; however, it must be executed with a strategy (just like any other marketing)! We’ve come full circle back to the importance of social media training, whether they are formal education, or informal education opportunities. I’ve noticed that more and more formal learning institutions (e.g. college and universities) are offering degrees, certificates, diplomas, and MBAs in social media. While I graduated before a degree in social media or digital media was a “must-have” for business, I am curious as to what programs are available for students, both young and old. This certificate program helps learners understand how to use social media technologies to benefit organizational goals and communicate with key stakeholders. Emphasis is on the application of new and emerging technologies for those currently working in the information systems and marketing fields, as well as for those from other fields needing to build their social media skills (“UAB,” 2013). One of the benefits to this certificate program is the program’s brevity. With only four courses, learners can quickly attain a certificate in social media. UOIT: Bachelor of Arts in Adult Education and Digital Technology. UOIT identifies that there is a need for individuals with the knowledge, competencies and skills associated with teaching and learning in adult education environments in the digital age. The Bachelor of Arts is developed on UOIT’s strength in digital technology and Faculty of Education’s focus on learning and technology (“UOIT,” 2013). This program has it’s perks because it is offered online. However, learners must work personal/professional schedules around the pre-scheduled synchronous group activities (i.e. all learners log in at the same time). This program is an interdisciplinary program that capitalizes on the strengths of existing courses in Graphic Design, Communications, Business Administration, Psychology and Statistics. Four innovative courses, created specifically for the Social Media major are also included in the curriculum. This is one of the first programs that caught my attention. Launched in September 2012, this program introduces topics of marketing, communications, psychology, graphic design, statistics, and (of course) social media. Although it is not offered online, classes are small and focuses on tactile, hands-on learning – a personal favourite of mine! The B.S. 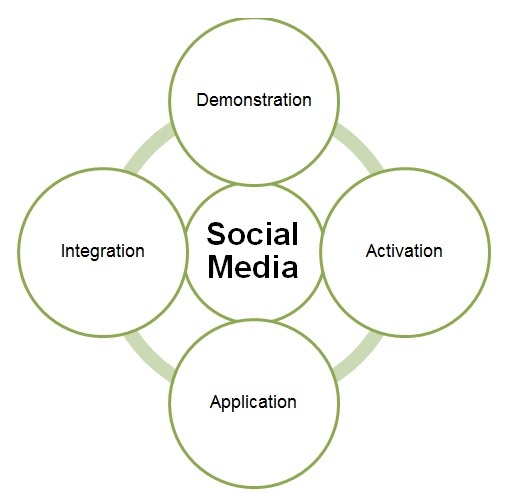 in Marketing interweaves social media theory and practice with traditional marketing strategy. By choosing the concentration in Social Media, students dive deeper into the ever-evolving and high-growth online social media marketing environment. Students learn how to target and engage online communities, growing them and using them to spread brand messaging to new audiences. Learners complete a business degree with a concentration in social media. I like that this program weaves critical business knowledge (accounting, law) together with social media. As we know, social media is just another business tool, and must be integrated as such. Learners collaborate and explore how social media is applied to marketing, corporate branding, fundraising, social media campaigns and within organizations to support employee engagement, retention and corporate communication. Through case studies, online discussions and assignments, learners develop the skills and competencies required to effectively utilize social media tools. This certificate program can be done 100% online. The five courses must be completed within a two-year time frame, and it is not recommended to complete more than three at one time. This is one of the few formal education social media opportunities I have discovered in Canada. The purpose of the program is to create challenging simulations of professional practice in which students can work in social media environments and that graduates can evaluate the current state of academic knowledge, professional practice, and their own scholarly work. Finally, the program encourage students to become reflexive professionals working in social media environments with a commitment to continuing professional development. This in-person program can be taken either full-time or part-time. This program appears to focus more on the macro-strategy than the micro-tactile learning. This program has been designed to help learners develop an understanding of social media and how to use its power to either enhance your existing business activities, or work with clients to realize their own ideas and ambitions. Learners will explore the context of Social Media within commercial and public environments, and all learning will be applied through practical and technological skills and underpinned with a knowledge of branding. This program is offered only in-person and includes lectures and projects. Good news for students – there are no exams because the program puts an emphasis on the “real world” application. The Social Media Marketing program is designed to provide participants with a foundation and skill set in the new, evolving world of social media tools and strategies so that they can immediately apply them in the workplace. This is an interesting program! If I were to design formal education on social media, it would be structured similar to this certificate program. Completed over two years through in-person learning, learners develop a tactile and practical understanding of social media and how it applies to their business. The Certificate in Social Media for Government enables professionals tasked with public affairs or communication functions (internal or external) to develop the expertise necessary to create, implement, manage, and assess social media campaigns for government organizations at the federal, state, or municipal levels. UNIQUE! This certificate program focuses on public servants, individuals who work for municipalities and government. The program is flexible as it offers a blend of online and in-person study. Learners will require a bachelors degree to enter the program. The only negative is that learners are required to have a basic understanding of the social media platforms… this could discourage key learners. This certificate program is designed for professionals who would like to hone their skills in how to use multimedia tools and how to harness the interactive power of the Internet to build an audience. Participants will receive training in how to build their own web presence, including a web site, a blog, an audio slideshow, and a video; as well as develop skills in social networking and search engine optimization. This program is interesting because it focuses on social media as well as photography and video production! They are functions that work together – so why not teach them together. Under program requirements, learners are required to have a Google Gmail account – this may be a first! University of Florida: Masters Degree in Social MediaIt’s important for higher education to stay relevant and be up-to-date with cultural change, new technologies, and innovation. By earning a master’s degree in Social Media online from UF, students have the opportunity to stay active in their current profession while building the future-focused tools, techniques, and practical knowledge to take advantage of new opportunities, add value to their current position, and expand their professional reach. An MA with a focus on social media – interesting concept. UF has a focus on remaining current to both future and current students. This degree (one of its kind) may draw a particular crowd! My business, Jennifer Baker Consulting, focuses on providing tactile, hands-on learning for businesses seeking assistance with their social media. I integrate guided practice into my private one-on-one sessions, and integrate opportunity for learners to practice new skills in group sessions to ensure that learners are receiving the best education. I would love the opportunity to help your business learn about the power of social media! Many businesses have utilized advertising on Facebook to promote their business’ products and services. 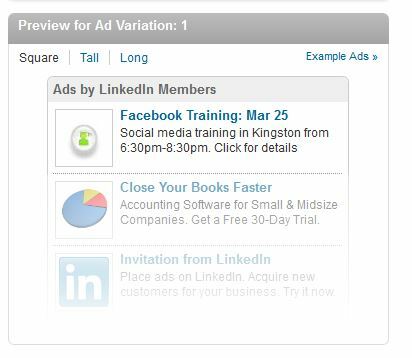 Facebook makes it easy for advertisers to design an ad and target it to a specific group of people. 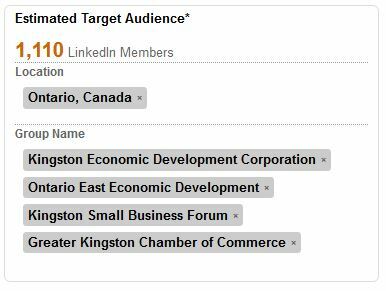 But did you know that businesses can advertise on LinkedIn? Today I will bring you through an example of developing an ad for a small business in Kingston, Ontario, Canada. 6. Create a headline for the ad. The length of the headline can only be 25 characters. 7. Create copy for your advertisement. The length of the copy can only be 75 characters. 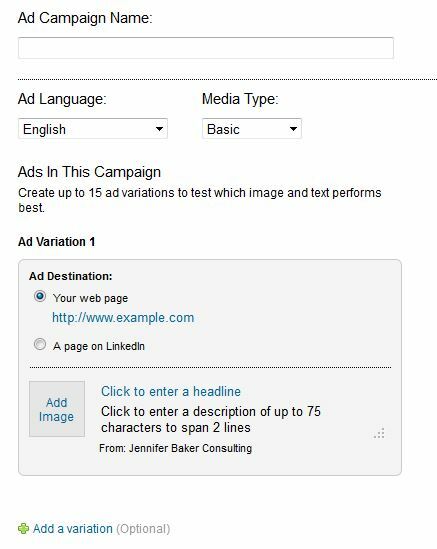 Within the targeting options, advertisers can be as casino broad or as specific as they require. Targeting options include: location, company, job title, school, skills, group, gender, and age. For the purpose of this example we will focus on location and group. NOTE: Advertisers must ensure that advertisement targets over 1,000 individuals, otherwise the ad development will not proceed. 12. Choose a daily budget. This can be as low as $10/day. 13. 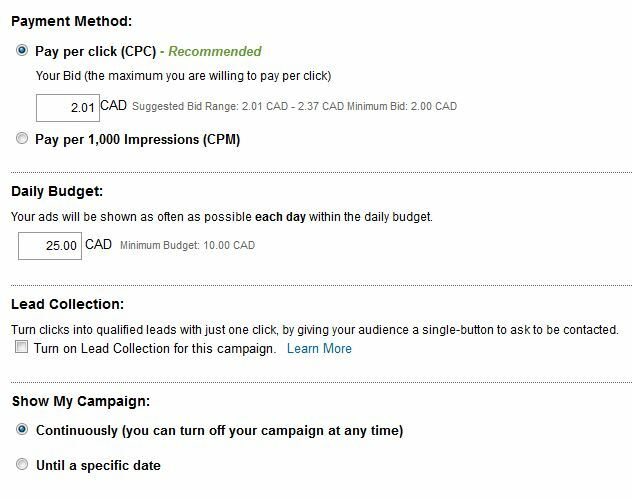 Set an advertisement schedule. Has your business used advertising before? How did it work for your business?